I am an unabashed breakfast eater. Sometimes, I hear stories about how people get up in a rush and go to work without eating breakfast. I can't even imagine it. I mean, how could those people breathe on an empty stomach, let alone sit up straight and speak in full sentences? I used to eat peanut butter toast and fruit for breakfast, along with some strong black tea, of course. Scott added eggs and coffee to his breakfast and he was a happy camper. About two months ago, everything changed. After seven blissful years of married breakfasts, Scott decided it was all too much work and took too much time in the morning. 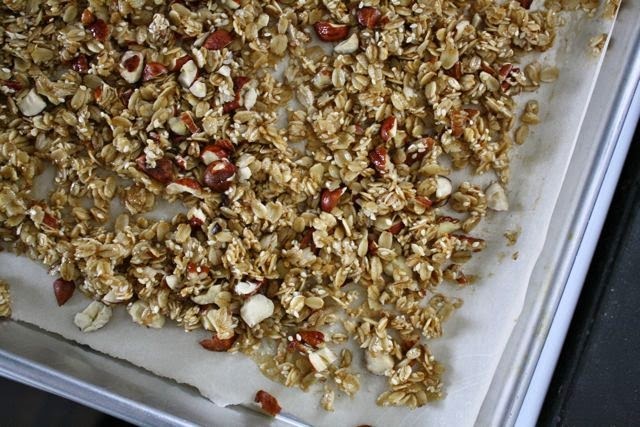 Now, I make granola or oatmeal on Sunday, and then we dish it out or heat it up throughout the week. I still insist upon the fresh fruit, but actually Scott was right: it is much easier to just dish up some granola instead of toasting toast and fussing with eggs. When I first made it, I wondered if the cacao nibs would make it too sweet for breakfast. 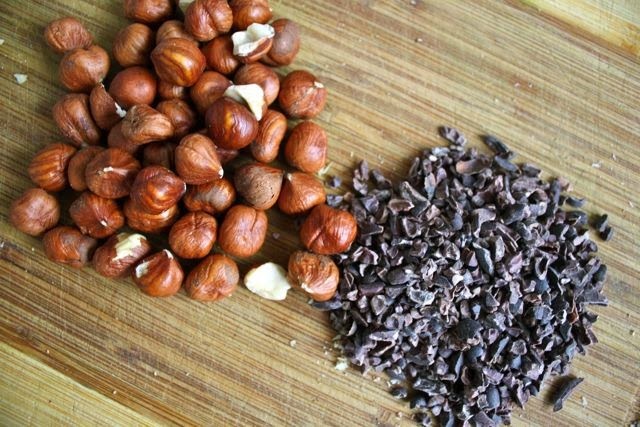 But no: cacao nibs are just cacao beans that have been roasted – no sweetener added. They actually kind of remind me of little pieces of coffee beans, in a good way. 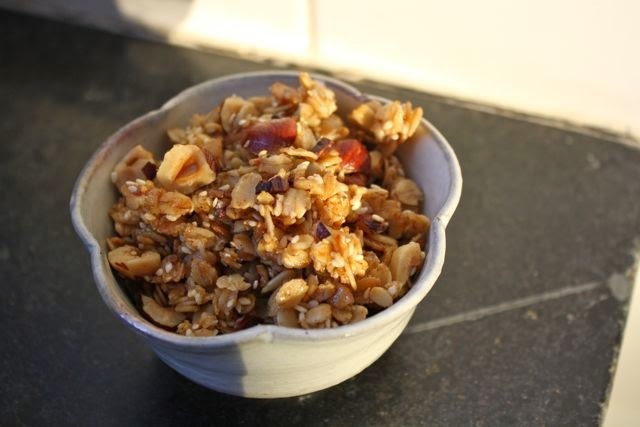 In any case, the granola is golden and lightly crunchy and completely the right thing to eat for (a quicker) breakfast. My thanks go out to Megan Gordon, who wrote the lovely Whole-Grain Mornings. Megan is based in Seattle and she runs the popular Marge Granola. She gives a couple granola recipes in her cook book – I also tried apricot pistachio – and they're both revelations. They taste just exactly like I always knew granola could: not too sweet and nicely toasty, with lots of nuggets to get excited about. Megan, you have helped save breakfast. Get out your biggest cookie pan. If you don't have a sheet pan, use two regular-sized cookie pans. Line with parchment paper or a Silpat. Preheat the oven to 350 degree Fahrenheit. Now, get out a big bowl. 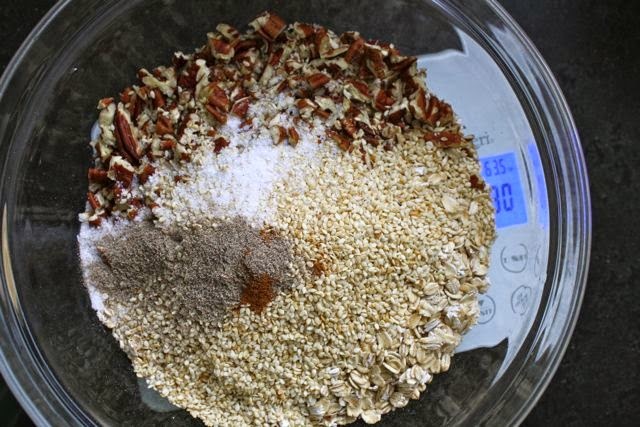 Stir the oats, sesame seeds, walnuts or pecans, salt, cinnamon and cardamom together. Pour the vanilla, maple syrup and coconut oil on top and stir it in. Pour the mixture onto your prepared pan and spread it evenly. Bake for 15 minutes. Stir the coconut or sunflower seeds and hazelnuts in. Bake for 18 to 20 minutes, stirring once halfway through. It should be fragrant and golden but not too dark – it will keep cooking a bit as it cools. Once it's cool, stir the cacao nibs in. Store in an airtight container on the counter for 3 to 4 weeks – although I bet it'll be gone in a few days. You may also freeze it up to 3 months. *I buy lightly-toasted sesame seeds at the grocery store for everything. I find they don't burn here, so it saves me the pain of buying raw on top of the sesame seeds I already have. **Megan calls for coconut oil, but I haven't had it in the house. 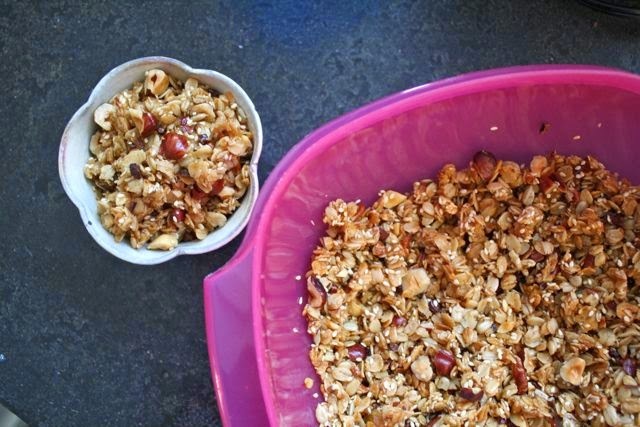 I've been using olive oil (which Megan uses in her other granola recipes) and it's great. Oh wow. Made this tonight. Amazing! So glad you liked it -- we're also eating it as breakfast to bring in the new year year.